If you hate to do laundry or dread making a shopping list for the supermarket then the gadgets of Day 2 at CES 2018 are sure to put a smile on your face. From a machine that can fold clothes for you to an impressive new smart refrigerator, the way you care for your home will change dramatically with the addition of any or all of these devices. Read on to find out about the newest appliances and check back with us later today for updates. A fridge that can tell you what you need, suggest recipes based on what’s inside and start your smart oven for you? Yes, that’s exactly what you get with this appliance from LG. Using AI (artificial intelligence), it has a touchscreen that turns clear on the front, so you can see inside without opening the door. And thanks to the AI component, it can also do things like give you a pudding recipe for the bananas inside that are about to go bad via Alexa or have Alexa pre-heat the oven for the roast you have marinating. The fridge is a part of LG’s new THinQ platform and as of yet there is no release date or price. Clean clothes faster- and using the right settings, using these 2 new appliances’ the washer can clean a load of clothes in as little as 30-minutes and you can start or stop it using the app. You can also choose water setting based on preferences, altitude, and other important factors, so delicates and other materials are handled properly. No word yet on pricing or availability and there were few details on the dryer. 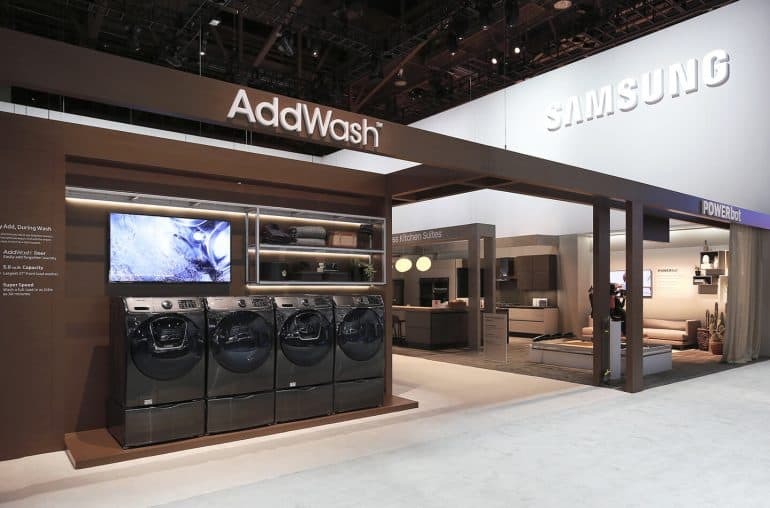 Samsung also unveiled a smart washer, the WW6850N Quick Drive unit. The main selling point of this model is that it can clean 35% faster than other models without sacrificing cleanliness and it’s ability to work with Samsung’s ThinQ platform. So, you can program and control washes even when you’re not in the room. Oh, and it measures only 24-inches across, great for those with limited space (especially if you grab the companion stackable dryer). No price or release date as of now. See other appliances like steam-cleaning machines 2018 and Power Cleaning Floor Gadget. This would of been first on our list, but it’s not expected to hit stores until 2019; but we are still really excited about this automated laundry folding machine, which can fold anything, from sheets to triple X sweatpants with ease. The only things it can’t fold are underwear, socks, and kid’s clothing under the age of 5. Foldimate expects it to be available in 2019 for around $980. Are you excited about all these great new home smart appliances debuting at CES 2018? Tell us what you think and be sure to check back with us for more news from the show later today.